MFP: You’ve run a successful NPSL amateur team for the better part of 8 years, so what inspired you to make the leap to NISA? TK: We’ve struggled with it mightily, to be honest, but as the saying goes, you never cross the same river twice. We’ve had a remarkable record running an amateur soccer team, but there’s only so much we can do three and a half months a year, and we think our city and our fans want more. We feel the third division is a perfect fit for us, and NISA has a great structure and business proposition. MFP: Building upon that, were there any other leagues you entertained or considered? TK: Well, suffice it to say we had- and still have- multiple other options to play professionally. NISA, however, has the business model that we think will best allow us to preserve the soul of our club. It offers the greatest degree of self-determination, and the chance to see promotion and relegation instituted in the United States for the first time. MFP: What was it about NISA that sold you on joining the league? TK: Most of that I’ve answered above. I’d just add that in addition to feeling this is the best business model for us, we feel it’s the best for US Soccer and its continued growth and development in this country. MFP: You’ve been in Finley for your entire existence, and despite what Don Garber may think about it, has served both your team, the University of Tennessee (Chattanooga) and the US Men’s National Team very well. However it does come with a price of rent, and has a current capacity of a little over 20,000 fans. Are you planning on staying in Finley long term, or do you have any aspirations for a more intimate, modular, soccer specific stadium that could potentially feature a grass pitch? TK: Finley has been a great home for us, and it has indeed served us well, but our rent has increased many thousand fold since 2009, and we’ll have to consider other options if we can’t find a way to restructure our deal in a more mutually beneficial way. I’m on the board of the Stadium Corporation as well, so have to be delicate here, but we’d actually prefer to stay there provided we’re able to negotiate a reasonable contract. We’ve put that facility solidly into the black, so I think it would be kind of nuts for both parties if we can’t come so some agreement. We do have some great other options if we can’t work it out, and some other those could involve grass, though I am not a grass snob. Turf is eminently practical and the newest varieties play very well. MFP: Moving into the business side of the equation, what kind of changes do you need to make within the club, to maintain your success but on a professional level? TK: One of the reasons we’ve been successful is that we’ve devised ways to be very productive with very limited staff, mainly through the use of technology. Honestly, I find US Soccer’s staff level mandates oddly arbitrary, though I understand them as proxies for commitment and stability. So we’ll have to add more staff- probably more than we actually need- and of course take on a professional payroll and manage a more extensive travel budget. We’re also forecasting modest increases in ticket prices and ambitious but achievable sponsorship increases. But we’ve done all of this before on some smaller scale, so we’re confident we’ll succeed. MFP: Are you taking on new investors, and if so, can you tell us about them? TK: We’re currently planning to raise a Supporter’s Trust. We just need to find the right legal structure to conform to US law, and that’s been a challenge. I’ve spend countless hours researching this and speaking to European colleagues, so I am hopeful we’ll have the structure finalized soon. We may take on outside investors, but may not. I meet the D3 ownership threshold requirements, so we don’t need a “Mr. Big” , but may do a raise to bring in some smart, helpful voices and to diversify our risk. MFP: You know the amateur ranks very well, so how does that transition into the professional side when it comes to recruitment of new players? TK: Money is the great leveler, but we feel our competitive advantage in recruiting amateur players to Chattanooga’s fantastic environment will carry right over. Money being equal, we think players at this level would rather be in front of our incredible fans than anywhere else, The quality of life is outstanding here, and the cost of living is low. 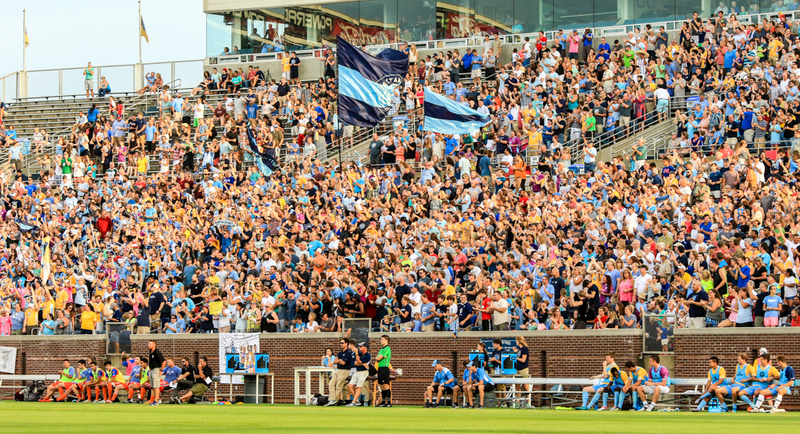 Plus, there is nothing like having the Chattahooligans inventing chants around your name. Nobody does it better. MFP: Are you focusing nationally in your talent search or are you looking at more of a homegrown model? 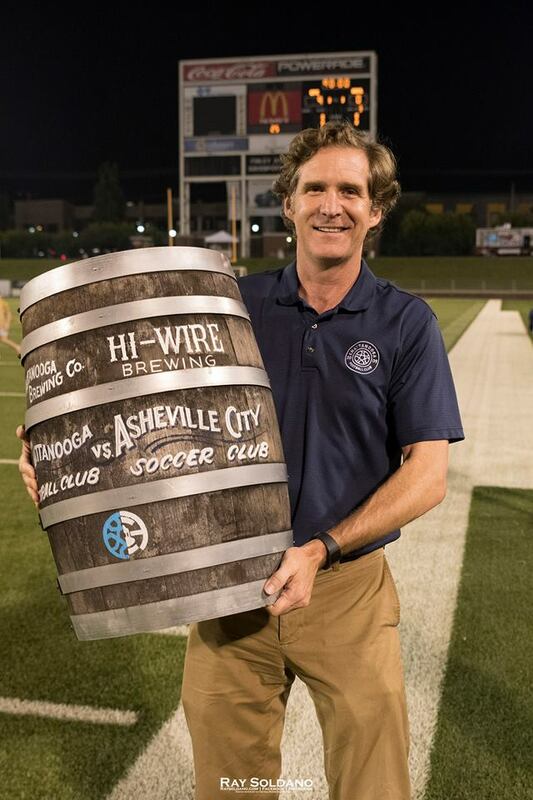 TK: Nothing puts butts in seats more reliably than homegrown talent, so we are dedicated to our academy system (Chattanooga FC Academy) as well as recruiting from the considerable Latino population in our area, but putting the best possible team on the field is always the primary goal. Hopefully we can do both. MFP: You are one of the few lower division clubs to boast a women’s soccer team as well. Are there plans to bring them to a professional level as well? TK: Again, most people would be shocked to learn how small, lean, and agile we are. Our strategy is to build capabilities in our stakeholders and fertilize growth as able. That would be great, but it’s really up to Gretchen Hammel and Erin Ridley and the women that run that program. We think women should run a women’s program, and that’s exactly what happens here. MFP: We understand the choices for women’s soccer is extremely limited to either WPSL on the amateur side, or NWSL on the professional side. Given a choice, would you like to see a league similar to NISA that can bridge that gap in women’s soccer? TK: Ideally, yes, but I am a utilitarian and a pragmatist. If they can sell enough tickets to monetize that, we’ll do everything we can to support them within the confines of our available bandwidth. I think we may be a few years away from that yet in a market our size, however. MFP: Moving back to the men’s side once more, how do you see your team competing with SEC football for the attention of random, casual fans? TK: We certainly do anticipate that being an issue, though our fan surveys seem to indicate that they don’t care; the vast majority told us they’d rather see us play than watch anything else, and it was a healthy sample size. That said, I think we’d be nuts to go up against gridiron football on a Friday or Saturday night, so we’ll probably play on Sunday afternoon, or perhaps Tuesday or Thursday evenings, in September and October. MFP: How has the news of going professional been received by your fan base, specifically the Chattahooligans? TK: The vast majority of our fans have encouraged it and are very excited by it, but there are some vocal fans who aren’t on board and want us to stay in the amateur ranks. We get that though- we have doubts as well. We have the freakish luxury of being able to stay at the amateur level and be viable, at least in the short term, so it’s not an easy decision to add millions in expense. But the landscape is changing around us, and we have already passed up multiple opportunities to move up. We feel this is the best path both for us as a team, and for the future of American soccer, and we hope and trust that history will prove us right. MFP: You’ve been broadcasting your matches in full HD and showing them on YouTube for more than 2 years. What are your plans to upgrade your broadcast exposure now that you’re going to a professional level? TK: We’ll be studying that. We have a very dedicated volunteer (El Conductor, to whom we owe a huge debt of gratitude) who has headed that effort since the beginning, and we’ve added some staff since then that we’ll be working with to take it up a notch. The guys at Detroit City do it better than anyone so I think a field trip may be in order. MFP: Are there any plans for a logo or team rebranding? TK: Hell no. Our branding will never change fundamentally, though it may evolve here and there. We are who we are and our branding got us here, thanks to (co-founder and Brand Director) Paul Rustand, so we are not leaving the date that brought us to the dance. We’ve considered adding a mascot but that’s as conventional in American sports terms as we are ever gonna get. MFP: In the realm of sponsorships, do you feel that going to a professional model will give you greater opportunity for sponsors? TK: Yes, for sure. We’ll be playing twice as many games, and we’re projecting twice the sponsorship revenue. Up to now, it’s something we did in our spare time, so this is an area where having a full-time staff will pay huge dividends. We have a lot of unsold segments we feel we’ll pick up quickly. MFP: What do you feel will be your biggest challenges you’ll face this upcoming year? TK: Well, to clarify, we won’t enter NISA until 2019, but if you mean “biggest challenges in transition”, it’ll definitely be the staffing up and running of this new, larger company. Provided we can get the right people in place, things will actually get easier. MFP: Here’s the third rail of American soccer – how do you feel about the concept of promotion and relegation within the realm of soccer in the US, and how do you see Chattanooga FC participating in that model? TK: Pfft. Are you kidding? See my letter to Don Garber: https://www.chattanoogafc.com/news/open-letter-garber/. In short, I think the sooner we get to pro/rel, the sooner our sport will cement it’s permanent place in the top ranks of sports in the US. Until then, we are just whistling past the graveyard, risking another meltdown and dissolution. Though it’s not the main reason, part of why we feel NISA is so important is the pledge to institute Pro-Rel. We’d love to be the Leicester City of American soccer some day. And I think if the money for broadcast rights is ever going to reach the levels needed to grow and sustain soccer in the US, it has to happen. What MLS owners seem to miss is that although they’d risk getting a smaller slice of pie, the pie itself would be much, much larger. MFP: Do you feel that this move helps your organization achieve those goals? MFP: And just for fun – which would you rather fight: A hundred duck-sized horses, or one horse-sized duck? TK: No contest. A hundred duck-sized horses, for sure. I’ve fought a normal-sized goose before and it almost killed me. Plus, my French friends tell me horse is pretty decent table fare. You can find Tim Kelly at https://twitter.com/TimothyAKelly on Twitter, or at your local Ikea Café, checking out the meatballs.